Owner: Museum Bombarded by Human Ashes From Crematorium Next Door in Meredith, N.H.
A New Hampshire business owner says vehicles outside are covered in human ashes due to a crematorium next door. Doug Frederick, owner of the Motorcycle Museum in Meredith, said the ashes come from the chimney of the Mayhew Funeral Home. "This was our dream, to come here and have this motorcycle museum," said Leslyee Frederick, Doug's wife. That dream became a reality for the couple six years ago, which has now, they said, become a nightmare. "To be thinking of wiping up someone's human remains, it's just disgusting," Leslyee Frederick said. Doug Frederick has documented the alleged problem with photos. He says ashes from the crematorium are landing on his property — and that's not all. "Sometimes, the smell is so intense, it's nauseating," he said. He's taken his complaint to Meredith Town Manager Phillip Warren, who says the funeral home has the proper permits and isn't doing anything wrong. "It's similar to neighbors who can't agree on on a fence or an installation," Warren said Wednesday. "It really isn't an issue town gets involved in." 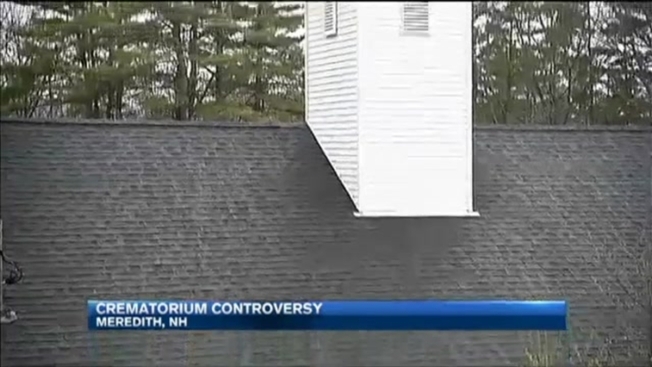 In New Hampshire, crematoriums are inspected at least every three years. The owner of Mayhew Funeral home, Peter Mayhew, has an active state license. "The Mayhew family has been operating funeral homes in New Hampshire for over 45 years," he said in a statement to necn Wednesday. "Our crematorium is closely regulated by the state and inspected frequently. We have received no indication of violations of any law or regulation. While Mr. Frederick is clearly upset with us and disappointed with the town of Meredith, we will continue to serve the community as we have for decades." But according to the New Hampshire Department of Environmental Services, emissions from crematoriums should be rather clear and are usually odorless. Wednesday, a museum visitor caught a whiff while necn's cameras were rolling. "It wasn't of a diesel truck going up the road or someone's furnace malfunctioning. It was definitely a different odor," Brian Keating said. "It kind of turned my stomach a little bit." The office of Gov. Maggie Hassan tells necn that Frederick's latest complaint has made it's way to officials at the DES. "It's just affected our lives deeply," Frederick said. "All we want to do is get this problem corrected." DES will be meeting with Mr. Frederick in the near future. Meanwhile, Mr. Mayhew says he will continue serving this community as he has for decades.